The larvae which burrow into and feed on the flowers of a number of orchid species are not attended by ants. Mature larvae vary in colour from greenish to dull red, colour tends to be related to that of the host plant, hence these pests are very difficult to see. Adults have large white to cream to pale yellow central areas with brown margins. 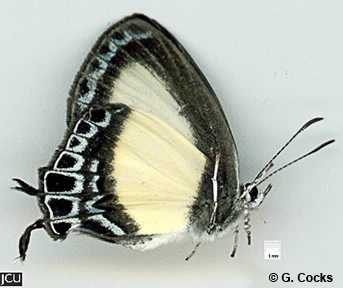 The hind has a number of subterminal iridescent blue spots, as well as two slender tails.